Easy and tasty, though I couldn't pick out the browned butter flavour, but with a little too sturdy a texture for me. Very sweet and moist but also quite delicious served with fresh berries and creme fraiche. Nice simple cake. Flavorful, moist, and light, although quite sweet. This was much better the next day - the almond flavor deepened, and the texture improved. Wonderful cake! I make it often for family gatherings or last-minute get-togethers. It's lovely with homemade jam or fruit. I love that I can make and bake the cake in an hour! Baked in a bundt, pan, this cake was light and spongy, had a lovely vanilla flavour, and appeared to be moist but wasn't really, though it wasn't dry either - it just needed to be served with something moist. Fortunately, it had the ability to absorb liquid without disintegrating so a fruit compote was a good accompaniment. It was very good with Dorie's roasted strawberries. Of course, my results were probably affected by the changes I made: I reduced the sugar by 100g and used cake & pastry flour (lower protein flour). I also successfully baked this in a 10-cup pan (smaller than recommended); the cake did rise above the top of the pan but the batter didn't spill over. I don't think I'll make this again since chiffon cakes offer a similar light, spongy texture but are also moist. Very nice moist, dense tea cake flavoured with vanilla and apples. The small amount of cinnamon wasn't noticeable so I may skip that next time and follow one of the suggestions to add some zest to enhance the fruitiness of the cake. It's a sturdy cake that slices cleanly and keeps well - perfect for travelling. This is a nice and moist, not too sweet loaf cake. Simple to make and simple in appearance. Would increase cinnamon next time. Keeps well for several days. We enjoyed the simple flavours of this cake. Baked it in a round springform pan for just over 50 minutes instead of the suggested loaf pan so it made for a low profile cake. Added extra cinnamon. 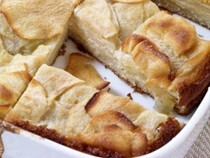 Delicious pastry with lots of apples that retain their shape and some bite even with a long baking time. There's only enough custard to bind the fruit chunks and the tart crust holds everything together. The sugar topping didn't brule properly for me so I'll skip that next time. This was a lovely dessert of apple strata and creamy custard. The components were similar to the Apple Matafan recipe I made recently from the same book - thinly sliced apples and pancake-like batter - but the texture (and cooking method) of this was far more appealing. For bold flavors, look elsewhere. This is subtle & pleasing, plus low in sugar & fat. Used Goldrush apples, just fine knife-sliced. Baked in counter-top oven at 375 degrees in only 35 minutes, foil-topped for the last 10. My batter turned out very liquid, and the cake was finished already after 30 minutes instead of 40-50. Apart from that a very quick and delicious cake! Will make again! Great quick and easy dessert especially if you use a mandoline to slice the apples. The squares are more apple than batter but there is enough flavor from the batter (I added some armagnac) to make it a flavorful dessert. Loved this. It is super easy and only takes about 10 minutes to prepare. I love a cake that is mostly fruit! It came together quickly--I did add some cinnamon and cloves. This was a really moist cake, a pretty pale orange in colour, with highly visible flecks of carrot. Unfortunately the flavour was a bit of a letdown: fruity but the ginger wasn't noticeable at all. Also, it was plenty sweet even made with only 150g sugar. I liked the idea of this cake and would make it again with triple the ginger and less sugar, perhaps following my not-so-hard-and-fast rule of equal weight of flour and sugar. Great ratio of sweet-tart vegetable to cake which was dense but moist with a pleasant butterscotch flavour. I used a 2" high cake pan and the batter, which seemed barely enough to cover the rhubarb, rose to the very top while baking so I'm not certain a 1-1/2" high pan would work. I reduced the sugar in the cake by 50g. I liked this a lot. Very straightforward to make. I didn't use a spring-form pan as the rhubarb had a lot of juices after caramelizing. I didn't think the center was cooked enough after 25 minutes so I did another two but I wished I had done an extra five as the center was quite gooey after the cake cooled. It looked very pretty (my rhubarb was quite pink) so I didn't bother with the glaze. I served it with Nigella Lawson's Muscat mascarpone cream from Forever Summer - a lovely dessert. Orange slice variation is excellent. Since I'm using more than one orange, I zest two usually into the cake. This creates incredible orange flavor. Two oranges is enough to mostly cover the cake, as well as the one orange that gets juiced into the batter. So three oranges total for a great cake. The flavour of this was wonderful with several layers of orange to experience (cake, syrup and topping). Next time though, I would add the poaching liquid/syrup to the hot cake as per the instructions for Odile's Fresh Orange Cake and add the orange slices just before serving since a thin, gummy layer of cake developed under the orange topping after sitting for a few hours. Incredibly good. It's tangy and not too sweet with a wonderful fluffy and moist texture, very much like eastern European style cheesecakes made with dry cottage cheese. Next time, I'll pre-bake the crust longer as it didn't seem to cook much further once it was filled. I used dried sour cherries in place of the raisins. This was a delicious pound cake with a fine, moist crumb and a good balance of white to chocolate cake. I couldn't taste the white chocolate in the vanilla portion but that's been my experience with other white chocolate cakes; that's not to say it didn't add some flavour, but I'll have to try it without to know for sure. Baked this for 50 minutes in a 22cm silicone bundt pan instead of 80 minutes in a regular loaf pan and worked perfectly well. Despite halving the sugar by mistake, kids declared this to be the best marble cake ever. Very quick to make, will repeat! Made this for book club, Started to watch it for time at around 60 minutes. Took it out at 70 minutes and it was good. This was in a Le Creuset loaf pan. Will definitely make again! These had a very nice fruity flavour and, typical of this mixing method, a dense texture. Despite the initial moistness, and all of the butter and olive oil (and the raspberries), they became dry quite quickly. This was an interesting cake. Naturally gluten-free, it was dense but moist and a pretty shade of golden yellow. Unfortunately, apart from being very (too) sweet, it didn't taste like anything. A little vanilla might have helped, or the bonne idee of adding nuts or cranberries. Moist but dense cake with the nutty crunch of poppy seeds, subtly flavoured with orange (the zest of 1 large orange only). I reduced the sugar to 180g. I agree with Zosia - this creates a dense cake that is still moist and you definitely get the crunch texture from the poppy seeds. I felt the orange was subtle - but it might have just been me, as the rest of the family felt like it was overwhelming. Probably won't make again as no one particularly liked it. I used white whole wheat flour and an orange, and also added 1/4 tsp orange extract. It was a dense, fairly moist loaf, with lots of poppy seeds. The orange flavor was barely noticeable, so next time I'd up the orange extract. I would definitely make this again. The only quibble I have with many of Dorie's recipes is the instruction to place the pan on an insulated baking sheet lined with parchment. I never do that unless I fear the pan might spill over, or if I specifically need to protect the bottom from browning too quickly. Since that didn't apply here, I ignored that instruction. Family loved this cake. It had great flavour and texture and was very moist. The flavour is described as "fascinating" and "haunting" in the headnotes. Unfortunately, that didn't mean good tasting to many who complained that the ginger and/or the lavender was overpowering. The orange was a nice touch though so I'll be including that in other spice cake recipes. This is a really nice cake that's easy to make, too! It ages well, and as long as you use good chocolate, it is anything but simple. With all of the butter, chocolate etc that went into this, it should have tasted far better than a soft granola bar. It wasn't bad, but it definitely wasn't dessert-worthy. I much preferred the "Crunchy Granola" that went into it. I didn't care much for the gritty buttercream but the flavour of the finished cake was good. Thanksgiving 2017. Despite being in the fancy cakes chapter, composed of layers of an easy brownie-type cake and an even easier ganache "frosting", it was actually quite simple to make and was a real stunner when completed. The author mentions serving, filling or frosting the cake with whipped cream so I made a cocoa whipped cream as a third component to fill the cake and lighten the chocolate flavour a bit. The varying textures and intensities in chocolate of the components worked well together but in the end, I think this cake is only as good as the chocolate you use. I used my favourite 70% cacao chocolate in the cake and 55% in the ganache and it was a big hit. 4-1/2 stars. Very easy cake to make, and a rich, soft, chocolatey concoction. I used a good Callebaut baking chocolate for the cake, and a Lindt 70% cacao bar in the ganache and it's a decadent production. The cake is rich, rich, rich, with six eggs a large amount of butter, not too sweet and a large cake. I can see a local restaurant charging 12-14/slice and getting away with it. Solid 4.5/5. A bit dry and crumbly at room temperature but with a good balance of chocolate and peanut flavour. Cold, the texture improved but flavour suffered. Fantastic cake! Chosen by my son as his birthday cake based on the book's cover photo, it was everything we hoped it would be: a little short by North American standards but quite sophisticated with components that could be made over several days. The glaze was a little thinner and took longer to set than a typical ganache with most of it just pouring off the cake during the first application but it worked the second time once I'd allowed it to thicken a little. My son requested a "ferrero rocher" cake so I added hazelnut flavouring to the cake, nutella to the filling and crushed hazelnut praline to chocolate shards. This was a lot of work but so worth it for a special occasion. It looks great and the combination of a moist chocolate cake, chocolate mousse, chocolate ganache and salted chocolate shards is a dream dessert for any chocoholic. Don't feel tempted to skip the shards on top - the salted chocolate is fantastic. An elegant dessert comprising vanilla diplomat cream sandwiched between layers of tender brioche. You do need to plan in advance since the components require time to chill, rest, proof etc...On baking day, you're to allow the rolled dough to rest 1 hour; I waited until it was room temperature and puffed in the centre, about 1-1/2 hours, before baking it. Great looking cake, a little time consuming to make, but not hard. Tastes mild and pleasant, better than I personally imagined,, but not so good that anyone asked for it to be particularly repeated. It reminded me of a giant creampuff. Beautiful, delicious cake. Not too sweet. It was a show-stopper. Surprisingly delicious (not a fan of gingerbread or marshmallow!) and not nearly as difficult as it appeared at first glance. Comprised of a lightly spiced genoise with a tangy cream cheese filling sweetened only with pecan pralines that were mainly nuts and not much candy, and a marshmallow frosting, the cake wasn't overly sweet and the contrasting textures of cake, filling and frosting were quite pleasing. I used only 3 egg whites for the frosting since I wanted less than what was pictured in the book - I think my layer was even thicker! Only 2 next time. I preferred this at room temperature with a softer cake and filling. Poor planning meant that I was making the meringue on a humid day. Though I wasn't able to achieve the proper volume and stiff peaks, it still baked up to be a gooey marshmallow layer with a crisp outer shell that contained the ice cream cake. The cake layer was fabulously chocolatey and decadent. Ice cream of choice was cookies 'n' cream. Everyone so enjoyed it, I'll have to try it again when the weather is more cooperative. Fabulous cheesecake. A cinnamon cookie crust and salted caramel sauce make this fairly typical American-style cheesecake very special. Lovely to look at and to eat (though I wish I'd added lemon juice to the prune jam to brighten it a little). Assembly is quite easy but be aware that chilling time is required at various stages. Very pretty cake with lovely flavour. I had the rose syrup but not the rose extract so substituted with raspberry flavouring which seemed to work very well. The cake was moist and had a floral flavour that didn't scream rose - though my daughter who's very sensitive to that flavour would disagree - and the cream filling was light and airy. The recipe doesn't indicate that the cake must be refrigerated to allow the filling to set but I recommend it; 2 hours wasn't long enough and the filling started to bulge after removing the wax paper strip. It sliced cleanly after 6 hours. Not quite a cake, but not a pie either. It consisted of a delicious fruit filling encased in a tender cookie-like pastry. Like a ginormous, jam-filled cookie with a streusel topping, quite nice filled with Diana Henry's tart strawberry-passionfruit jam. I replaced half the butter with coconut oil to reduce the buttery flavour (which I'm not fond of). My husband called this "the perfect balance between sweet and tart." Watch the times carefully, however, as both the par-baking of the crust and the tart itself were done far in advance of the stated recipe times. In both cases I had to cover the edges to keep them from over-browning. Surprisingly delicious apple "pizza" with a tangy cream cheese-yogurt "sauce" and crisp crust. I'll be a bit more generous with the apples next time as I used only about half the slices and the crust could definitely accommodate more without becoming soggy. These were as cute as their name would lead you to believe and delicious as well, albeit more labour intensive than a regular sized pie would be (but aren't all mini versions?). The recipe called for a double batch of galette dough (reviewed separately) which was quite easy to work with. I had the correct sizes of biscuit cutters for top and bottom crusts but found that the dough circles were too small and needed to be rolled out a little more after cutting. I used dried cranberries in place of raisins, omitted the sugar and added a squeeze of fresh lemon juice to the apples, which need to be diced quite finely to fit into the dough lined muffin cups. My pastry lids didn't adhere very well and juice bubbled out of every pie so I was reluctant to invert the pan when they were done; a small offset spatula worked perfectly in loosening then removing them from the tin. These were a huge hit but I'm tempted to make these as (easier) turnovers next time. For a tart with three components, this was quite easy to put together: sweet tart crust (best tart crust ever!) that can be made in advance and frozen; chopped pears that are pre-cooked and caramelized in a fry pan (my pears were quite firm and gave off little liquid); a topping of sliced almonds mixed with icing sugar and egg whites. I loved the textural contrast of all of the layers but I would have liked a little relief from the sweetness of each - perhaps some lemon juice on the pears or a few cranberries tossed in with them would have been good. I made this again with a couple of changes. My pears were less ripe and I used a hotter pan so there was less juice thrown off and they caramelized properly. I also used flaked almonds as I couldn't get slivered and I think I prefer the topping with the flaked. This is a lovely tart. This was really wonderful. The sweet tart pastry was quite a long process but the results were so worth it. The filling was of caramelized pears topped with a crackly almond meringue layer. My only issue was that my pears never caramelized because they threw off a lot of juice. I kept removing liquid but of course I was also removing sugar and butter too so it never got the caramelization going before they were reaching the point of being overcooked. I think next time I would start with a hotter pan. I suppose it depends how juicy your pears are. But anyway it looked very special and tasted great. I used a combination of Italian prune plums, red grapes and honey crisp apples to make this delicious galette. And, as usual, Dorie Greenspan's galette dough recipe did not let me down, producing a crisp yet tender crust. The filling of pears and cranberries flavoured with ginger was so fabulous, I wanted more of it. Next time, I'll double it and bake it in a more typical free-form galette shape. The recipe uses the book's galette dough, another pastry from this book that's very easy to work with. I was so bummed that I did not love this tart. The pear/cranberry/ginger filling did not have a great flavor. It's hard to describe but I thought it tasted slightly funky. I used Anjou pears and raspberry jam and would love to learn of others results with the marmalade alternative or with a different variety of pear. The galette dough was very nice and easy to work with. Make sure you seal the tart well. The filling juices leaked out of mine and created a burnt caramel on some portions of the bottom crust. Surprisingly delicious and an unexpected hit with even finicky eaters! It also wasn't difficult to put together since I had galette dough (pg 420) leftover from the apple pielettes. The balance of sweet meringue and tart cranberries was perfect and the textural contrast of crisp meringue shell and fluffy centre was very appealing. Definitely one to repeat. This was a great Christmas dessert - very pretty. I'm not generally a big fan of meringues but this was OK with the cranberries cooked inside it. You'd need to start this quite far ahead as the sweet tart pastry has lots of resting and cooling. I protected the crust edges with foil during the second bake with the filling - I think they would have got too brown since the meringue baking stage is an hour. This really was one of the best desserts I have ever made. It is quite time consuming and would be best spread over two days but the results are so worth it. The crust is Dorie's Sweet Tart Dough which is buttery and crisp - it's my favorite tart dough. There is a layer of baked lemony almond then a grapefruit/Campari mousse which is creamy but actually has no cream and is made with eggs and butter. Then it is topped with jewel-like slices of pink grapefruit. It looks gorgeous and tastes even better. I left out the Campari and it was still wonderful. It is best made over 2 days. Pretty tart with quite a few components, most of which can be made in advance. The sweet tart dough (page 414) was very easy to make and work with; I baked the crust from frozen on serving day. The cremeux is a grapefruit curd to which lots of butter is whipped in; it's very rich and buttery, almost approaching buttercream in consistency with a nicely balanced bittersweet flavour. I omitted the gelatin and whisked powdered agar agar into it just before pouring it into the tart shell. This was very much enjoyed by tasters who don't like grapefruit; I would have preferred a stronger grapefruit presence. Ripe peaches baked in a sweet tart crust is always going to be a hit in my family but mine didn't look much like the photo. I used 1.5x the amount of peaches, which after 35minutes of baking had shrunk to a fraction of their original size leaving a large gap under the top crust. Also, I couldn't detect the nuttiness of the browned butter....I think regular melted butter would have worked just as well. If I were to make it again, I would omit the top crust (and the browned butter). Lovely, fruity tart that requires practically no effort apart from making the crust, which is the easiest, most foolproof recipe ever and can be made in advance. Also quite pretty - definitely company worthy. I used peaches and raspberries for this tart. It would have been better with apricots but I couldn't find them anywhere. The peaches were a bit too moist so the tart wasn't as firm as I'd like but it looked pretty and tasted great. Dorie's sweet tart pastry is my favorite dessert pastry. That and the almond cream can be made the day before so the on-the day assembly and baking is easy. I had hoped the cherries would shine but embedded in a sweet almond cream, sandwiched between a cookie crust and streusel topping, they were quite lost. The tart was very sweet, rich and buttery, but not very fruity. The base recipe does not contain rum and almond flour but does contain egg yolks, vanilla beans and milk. The recipes for sweet tart crust and vanilla pastry cream from this book are among the best I've ever made and these 2 components, combined, create the perfect vehicle to showcase beautiful seasonal fruit. Fantastic dessert. Canada Day 2018. This is my favourite type of fruit tart - fruit baked in a tart crust - but its success depends on the quality of the fruit and my plums were a little underripe, quite sour bordering on bitter. The speculoos crumbs that absorbed the liquid added a subtle spice flavour. Edited to add: I made this a second time with ripe fruit (2017) - delicious! This is a good, basic recipe with a ratio of fruit to pastry that works well. The lime and fresh ginger set it apart from others and I wish I hadn't forgotten the mint because I think that would have been very nice as well. I'll definitely be making this throughout the summer with whatever fruit looks best. I liked the idea of this tart and with a few tweaks it could be fabulous but I found it to be too sweet. I fixed the topping with extra lemon juice and added the optional yogurt to the filling, and the chocolate tart dough I used (p418) brought a little of the bittersweet to the dessert but next time, I'll just reduce the sugar/honey all around. Very nice tart. Both the rhubarb and lime flavours come through clearly in the filling and it was tart enough to withstand the sweetness of the meringue. I did notice that the tart shell was not as crisp as it should have been (and usually is since I've used this recipe several times) and wonder if this is a case for shellacking the hot baked crust with egg white to protect it from the moist filling. Fabulous tart! The chocolate ganache filling wasn't as intensely chocolatey as some but it had great chocolate flavour and was incredibly silky and luscious. I served it with the recommended salted caramel and whipped cream. This tart is very decadent! I would definitely make it again. I served it with the salted caramel sauce as recommended. A five star recipe for sure! Surprisingly good, not-too-sweet, silky caramel custard baked in a sweet cookie crust. I strongly recommend skimming off the foam before baking. Delicious! Like an upscale Mounds bar. The candied chestnuts added sweetness, some texture and a subtle nutty flavour to an already delicious chocolate tart. The ice cream and syrup took this dessert over the top. It reminded me of tarte au sucre with its sweet, custardy filling. Fans of this kind of pastry thought it was very good. The lemon custard filling was very tart and needed the sweet cookie crust and meringue topping as buffers. As a fan of just about all things lemon, I really enjoyed it but some, even those who like lemon meringue pies, thought this was just too sour. I used The Cake Bible's Italian meringue to top the tart instead of the whipped raw egg white meringue from the recipe. Wonderful crust, wonderful filling. Bright lemon flavor, not too sweet. Wonderful summer dessert. I love Dorie's Sweet tart pastry (best ever IMO) and it combines beautifully with the lime filling. I scattered fresh blueberries over the tart before filling with the lime cream. This is a variation of the book's recipe Smoothest, Silkiest, Creamiest, Tartest Lime Tart, page 184 and we loved it. The layer of sweet blueberries and the sweet tart crust balanced the tartness of the lime filling perfectly. I added only 1/4 of the butter to the lime custard and it was still quite loose after the initial chill so I added some powdered agar agar (2 tsp for a half recipe) to help it set up in the tart shell. It worked. Soooo cute! Whipped egg whites lighten the vanilla cake batter which bakes into a tender mini cake that hides a nutella surprise. I dipped some in milk chocolate and others in white with the white chocolate the clear winner. I couldn't tell what was going on beneath the thin top crust that formed early during baking so I relied on the timing in the book, the author's description and my newly calibrated oven. Like sherrib, I baked them for 11 minutes and also felt another minute would have been beneficial. They were as the author described but I would have liked a little more cooked cake portion. I would consider making these again because the recipe is quite easy and everyone loved them. A delicious and easy recipe for individual molten chocolate cakes. I used cornstarch in this recipe. The instructions say to bake anywhere between 10 and 12 minutes so I baked them for 11. It could have used another minute (or maybe two or three) as they were a bit runny (Greenspan states that they will be runny at 10 minutes.) The tops formed a very satisfying, crunchy crust. The recipe calls for placing chunks of chocolate in the center of each cake. Greenspan hints at using frozen truffles for this. I should have taken the cue and frozen my chocolate (mine had been sitting on the counter of a very warm kitchen - I think the recipe would benefit next time from a longer cook time and colder chocolate center.) Delicious and easy, will certainly be making it again! Like the liqueur, these are very sweet and lemony. The batter comes together quickly with a whisk and the cakes bake up with nicely domed tops; the American style frosting is, as expected, excessively sweet and applied "French-style" was double what was needed. I tripled the lemon juice in the buttercream to introduce the tartness of the fruit into the dessert; lemon curd filling would also have been a good addition. Delicious cupcakes. I added an extra teaspoon of fresh lemon juice to the frosting. Thought it needed a little extra. Financier-type cake with the typical crisp and chewy crust and moist interior of the pastry also includes chopped bittersweet chocolate and a ganache topping that help cut the sweetness. Warm, they were all about the chocolate, but the flavour of the nutty vanilla cake came through at room temperature. Creamy peanut butter buttercream sandwiched between tender chocolate mini cakes make for a crowd-pleasing treat. Also quite quick to make. My yield was 30 sandwiches using a #70 cookie scoop. The raspberry provided some relief from the sugar and butter in these but also succeeded in overwhelming the pistachios. Perhaps toasting the nuts first would help. Very buttery and sweet, they had the usual crispy-chewy texture of a financier and tasted of green tea without any bitterness. The batter was a very scary shade of green that fortunately baked up to be a much more attractive hue. Not expecting that to happen, I baked the batter in a madeleine pan in an effort to make them more appealing. Financiers aren't my favourite sweets - too sweet, rich and buttery for me - but at least these ones had the flavour of toasted pecans and a little crunch from the cornmeal to commend them. Family and friends loved them. To reach the yield in the recipe, I used a scant tbsp batter (13-14g); they baked in only 14 min in my oven. Best madeleines I've ever made! Lovely, tender, delicate texture and wonderful lemon flavour, especially with the tangy glaze. In my oven, chilling the pan made no difference to the size of the bump, which was quite respectable (a partial batch was baked without chilling). Yield was 21 in a pan that makes 16. I used #40 scoop to fill madeleine pan. Soft and tender, these little tea cakes had a very nice ratio of vanilla to chocolate, with neither overwhelming the other. The fragrance of the lime was quite powerful during baking but the flavour was subtle and added some interest. My yield was 16. These are delicious, and much tastier than the picture suggests.Worth investing in the silicone mold. Baked them a bit longer to get a really dark bottom, which improved texture and taste. Perfectly domed with a bit of sweet crunch from the topping, these were good enough to eat without a filling but with the author's vanilla pastry cream, they were a perfect, decadent treat. This is a basic recipe for a family favourite but the novelty shape seemed to make them more of a hit than usual! I used a #70 cookie scoop to portion the dough but I'll stick to piping in future as the tops were a little craggy. A delicious variation of a cream puff. The chocolate was an amazingly strong presence despite the small amount of cocoa in the dough and the filling was the perfect cool and creamy foil for it. I made this recipe to use up some mascarpone left from another project; I had almost double the requirement (200g) so increased the other ingredients accordingly intending to freeze the extra. I used it all and my puffs still weren't as well-filled as pictured. I used vanilla flavouring only but couldn't resist adding the pink food colouring. An impressive dessert that was greatly enjoyed by guests. It was quite the undertaking with 4 components (5 if you made the crackle-top cream puffs as I did). I ended up buying good ice cream but made the raspberry coulis from the book in addition to the bittersweet chocolate sauce. No yeast-raised dough here just an easy choux pastry that's fried until puffed and crisp and rolled in sugar. They were best eaten warm but they were still tasty hours later when they had lost their crispness. I really enjoyed the construction process and they had great texture and flavour - though the latter depends somewhat on the the jam you choose - but don't let their size fool you...they are very rich. If I were to make them again, I would make them half the size. These are amazing! Contrary to my expectations they were actually very quick to make (only 1 hour total time required before actually being able to eat them - they are delicious still warm). I used 3 small apples, which weighed only half than needed in the recipe and I had more than enough filling for 6 croustades (however my muffin tin is not that deep). A winner! Cute presentation and I thought the flavour of the filling was fine but was disappointed that none of the caramel came through. I served them with creme anglaise and vanilla cranberry sorbet but as they weren't very sweet, I think a drizzle of salted caramel would have been good instead. I personally didn't care for the relatively large pouf of pastry on the top and would use shorter pyllo strips if I were to make this (or something like it) again. I'm not a fan of the texture of cooked banana and though these were better than I expected, they weren't good enough to convert me. It didn't help that the (optional) peanut butter that I hoped would help detract from the banana didn't soften and meld with the other ingredients. I omitted the butter (which I also don't like!) from the filling. Delicious plus very quick! I have to admit that I did not follow the instructions properly and did not freeze my puff pastry before adding the filling - I just never figured out how to fit a baking sheet into the freezer. This resulted in a very soft and sticky dough which could not be sealed properly. Apart from the ugly looking finished pastries still a keeper! These turned out exactly as described: sandy, buttery, sweet and just a little bit salty (and quite addictive). I used vanilla bean paste. Lovely vanilla flavour and perfect balance of salt-sweet but the dough was very thick and I really struggled to pipe the cookies out. They didn't spread during baking but the finished texture was as described: crisp followed by melt-in-your mouth. This is the second sable recipe from this book I've had a problem with; I'm weighing my ingredients so I don't think that's the issue. I wonder if Canadian flour, which is higher in protein than most American flours, is a problem in this type of recipe. Other things I've baked from this book using the same flour (cakes, pastry dough) have turned out well. A conundrum for sure. Edit Sept 29. I made these again with Cake & Pastry flour, a lower protein blend that's available here. The dough was not nearly as stiff and the cookies spread a little during baking; this batch looked like the photos in the book. I'm now wondering if the things I thought turned out well would have been even better with this flour. Melt-in-your-mouth cookies with a bit of crunch and an interesting nutty flavour from the toasted buckwheat flour. Rather than re-rolling and chilling scraps of dough, I avoided scraps altogether by using one of the author's tricks of putting the dough into ziplock freezer bags (1/2 batch per large bag), rolling it out (to a scant 1/4"), chilling it then cutting into rectangles/squares. I'm in complete agreement with br22's review. With much effort, I did manage to make the crumbly dough come together but wondered why it couldn't have been made in a food processor; I was tempted to add an egg yolk or a little water to help bind it. The raw sugar didn't adhere to the rolls of dough and the cookies didn't spread during baking and were a rather unattractive colour. On the positive side, they did taste good! These tasted wonderful. The instructions however are a disaster in terms of method. To add insult to injury, the finished product looks nothing like the picture with respect to size and color. Crumbly, buttery, shortbread-like cookies that were made with an unusual method: the dough was first baked as a crumble, then combined with more butter to form a dough that was rolled, cut with cookie cutters and baked again. I must have rolled them thinner than recommended, though I didn't think so at the time, because my yield was twice what the recipe states. Fans of shortbread loved them. I used them in the springtime cookies and curd recipe from the same book. Pretty iced cookie buttons with a cake-like texture and pleasant vanilla flavour. Nice coffee or tea time treat. The shortbread-like cookies were crisp with a melt in your mouth texture; the tart rose hip jam I used saved them from being too sweet. The dough was easily rolled out between parchment sheets but softened very quickly so I appreciated the author's directions to keep it chilled. Lovely, delicate vanilla cookies with crisp edges and soft, cake-like centres. They were very quick to make and the batter was quite forgiving as well; my piped worm-like squiggles transformed into even flat ovals during baking. I'm not much of a cookie baker so these were a little too fiddly for me. The dough was easy to work with but I found I had to mound the crushed candy bits in the cutouts to get a decent layer once melted (quite messy, this). I wasn't using the optional herbs so completely forgot the egg wash and the finishing sugar. They were still very good and quite festive and pretty but not something I'll make again. I love finding quick and delicious ways of using up leftovers - egg whites in this case - and this recipe is one of them. The cookies weren't much to look at but they had wonderful texture with a crisp exterior and a moist chewy centre. I wish I had omitted the optional cinnamon to allow the delicate almond flavour to shine. I used a #70 cookie scoop which was too large so my yield was only 25. Yes it's a very quick recipe to make. My first batch burned to I cut the baking time to 6 and turned then 2. A very crisp sweet cookie. This was my first attempt at macarons made with an Italian meringue and only my second attempt at macarons. The instructions were quite detailed with plenty of tips given along the way but I would have liked a few process photos particularly of the whipped egg whites with "medium-firm peaks" and of the finished batter for its consistency. I used weights for the recipe and divided my batter to colour half of it. Though I used powdered food colouring, the dyed batter was slightly thinner and the cookies turned out as they should, with feet and without the dreaded hollow. I did lose a few to the hot spots in my oven. The macarons from the thicker plain batter, which also happened to sit the longest before baking, did not turn out well: they had feet but they also had the hollow and almost all were misshapen. I have no idea where the fault lies...... with my batter, the waiting time or my oven. This may forever remain a mystery as I have no plans to make these again. A cookie that even the author admits has little flavour, dipped in melted butter and baked again sounded odd to me but with half a batch of failed Parisian macarons on hand, it seemed worth a try. As it happens, these were quite good: they were a lovely caramel colour, had incredible crunch and tasted of browned butter. These light, crisp chocolate meringue cookies sandwiched with a melt-in your mouth ganache filling were fantastic. I thought the yield of 8 cookies was very low but the chocolate flavour was so intense, one was enough as a serving. I used walnuts in the meringue and 70% cacao chocolate in the ganache. As written, the dough was much too stiff to pipe. I doubled the egg white - and of course overworked the dough trying to mix it in - which helped a little. They weren't particularly pretty but they had a delicate flavour and crunch. These cookies use a blend of nut flour (either hazelnut or almond) and AP flour. I used almond as that is what I had on hand; I didn't taste the almonds in the baked cookies. The almond flour mainly changed the texture of the cookies. They were chewy yet crumbly. The cookies did not age well. They were good the first two days, but then seemed stale. These cookies tasted fine but were nothing special. These had good flavour but I think they would have benefited from a little less time in my oven - they had crunchy edges and chewy centres initially but were as hard as biscotti the next day though I stored them as directed. This is a very delicious and unique chocolate chip cookie recipe. I used pecan flour in place of the almond flour. The cookies turned out a bit drier than other recipes I've tried but yummy just the same. They were demolished by my two sons in a very short period of time! These had wonderful texture and flavour (provided you're a fan of coconut!) but the pastry was the star. The food processor method of making the dough, leaving bits of butter and cream cheese and baking chilled cookies ensured a rich and flaky pastry, somewhat like puff pastry without all of the work. I filled these with chocolate ganache so the chocolate flavour was quite intense and really fought with the spices. I prefer the traditional linzer without chocolate and with fruit filling. They tasted mostly of the nuts that went in to them that became nicely toasted while the cookies baked so you'll want to use your favourite. I couldn't quite tell when they were done and ended up underbaking them so most were still a little chewy but the end pieces were as hard as they should have been based on the author's description - I preferred the chewy ones. Wafer thin and delicately flavoured with orange, vanilla and lavender. They were tender and flaky like a rich cracker and not very sweet. Those looking for a super sweet treat were a little disappointed but I loved them. I rolled them 1/16" thick as instructed but my cookies seemed thinner than those in the book photo and my baking time was only 6 minutes. These were pleasantly spiced but I didn't care much for the texture which was hard rather than crisp. I made them to use in other recipes in this book and they worked well in both the plum tart and the apple crumble. I think these are impossible to over-bake - over 40 minutes in my oven (internal temp 200F) and they were still very fudgy. Also uber chocolatey and delicious. I used cranberry juice from an open bottle rather than wine from an unopened one to plump the fruit. I preferred them chilled. Very very fudgy - don't skip lining the pan with foil and spraying it well with cooking spray. That said - really delicious! This was clever! Very decadent, but not overly heavy or sweet. The brown sugar cookie base is amazing. 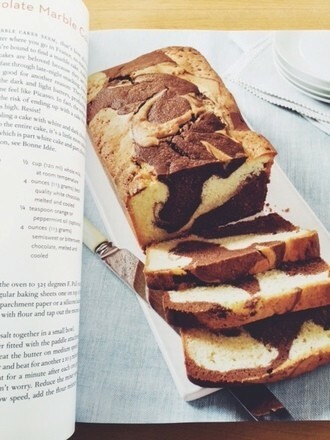 Recipe makes a small portion, almost the size of a large candy bar. The bars, consisting of a shortbread-like base topped with a layer of bittersweet chocolate were good but not particularly special. The highly addictive caramelized Rice Krispies topping (page 428) was a different story, adding texture, flavour and lots of interest to the cookie. I preferred these at room temperature with the more tender, crumbly base and softer chocolate layer. 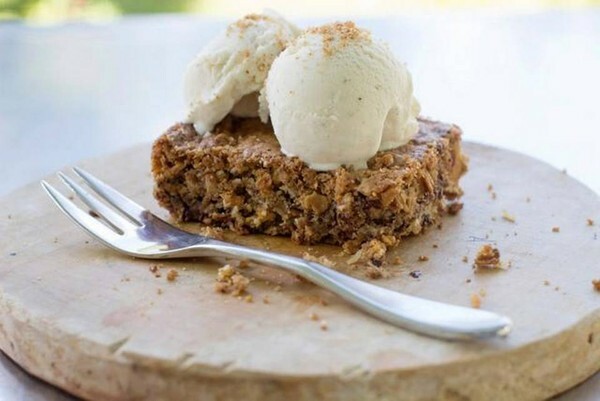 I made a few changes to this recipe to reduce the richness and liked the results: I used only 42g/3 tbsp butter in the curd and replaced half the butter in the shortbread crust/crumble with coconut oil. Next time, I'll reduce the sugar in the curd by 100g, then it will be perfect. I did as Jane suggested and used a thermometer to monitor the curd as it cooked; I don't know how long it took, but the temperature registered 185F when the first bubbles appeared on the surface (one of the signs that it was done). These were excellent. A simple almond shortbread base made in the processor topped with a tart lemon curd then a mix of crumbled shortbread dough and chopped almond scattered over the top. I had an issue with the curd, that I thought it had thickened and I was way past the suggested 8-10 minutes cooking so I took it off the heat and cooled it. But it was still very runny. So I heated it again, this time with a candy thermometer and cooked it to 170. That worked. So I suggest using a thermometer or to keep going until the curd is noticeably thicker (without curdling it!). A delicious and portable little snack. I made the recipe as written using cranberries and apricots but I appreciate that the author provided ingredient ratios so you could customize to match what you have in your pantry. And, as promised, they held together beautifully with the brown rice syrup. Lovely way to serve pineapple. I used only orange juice, apple jelly, vanilla bean and pink peppercorns and the intensified flavours of both the fruit and syrup were fabulous! However, what I thought was a rather large pineapple shrunk considerably during roasting and served only 4 in the end. I made this with lime marmalade. None of us liked this dish. Maybe the marmalade was to blame? I made this with a average-sized pineapple. For the liquor I used brandy, and I added a squeeze of lemon to the orange juice as my pineapple was more sweet than tart. Instead of a jar of jelly, I used a few tablespoons of honey; as a result, it was considerably less sweet and had a thinner syrup than if I had used the quantity of jam specified. For spices, I added a cinnamon stick, a star anise, a few slices of fresh ginger, a few pink peppercorns, and some Korean chili flakes. Served with a dollop of creme fruit, which I found necessary to cut the intense flavor of the fruit and syrup. A very good everyday fruit dessert. Delicious variation of a simple recipe. The bitters flavour wasn't as strong as its fragrance but it added complexity and complemented the rhubarb beautifully. I added some (optional) lemon juice to cut the sweetness and brighten the flavours. It made a lovely spring dessert served as suggested with the plain almond cake (which I made with 50g less sugar this time). This made for an easy and tasty dessert with some (optional) cranberries added to the apples and a topping of homemade maple syrup ice cream. The speculoos crumble remained crunchy and its spice flavour went well with the apples. I used a mini chopper to make the crumble topping. Only okay. Crumble was dry. If I ever make it again, I'd add some cider to the apples and a squirt of orange or lemon. This is the second recipe I've made from this book and my second disappointment. I'd like to discover what gives Dorie Greenspan such devoted fans. The crumble topping works well with the apples. The apples are simply combined with sugar so this isn't particularly sweet. This is pretty easy to make as it only has 4 ingredients. It can be a bit of a pain to break the cookies up and mix with butter but it worked out well enough. It took longer for my crumble to bake than the recipe indicated but it turned out well. I cooked it in a 12" nonstick pan and it turned out perfectly (20 minutes on one side, 8 minutes on the other). I used white whole wheat flour and lowfat milk to make it slightly healthier. I had some boiled cider, so used that instead of the brandy. My family enjoyed it for breakfast with a bit of maple syrup (because syrup is required for pancakes in my house). Not much syrup was needed since the matafan is sweeter than a regular pancake. I might use half the sugar next time. The flavour was good, reminiscent of cinnamon-vanilla French toast, but the texture was odd. It's described as somewhere between a cake and a pudding and it was that: dense and moist, like a cake that had risen and fallen. I used Cinnamon Swirl Bread from Everyday Baking by Abby Dodge, pears and dried cranberries. Most of the topping sunk into the fruit, sweetening it and thickening the juices. What resulted was similar to a thick berry jam topped with a thin, crunchy crust. Also, there wasn't much fruit for 6-6oz custard cups....I used only 4 and filled them close to the top. I prefer crisps/crumbles where there's more of a distinction between fruit and topping and the fruit retains its integrity. This recipe was more labour intensive than others I've tried but the end result was an airy mousse with a rich chocolate flavour. Do pay close attention to the ingredient temperatures mentioned (my sugar syrup got away from me very quickly and had to be made again). Incredibly light and billowy but despite its cloud-like texture, also very rich. I served it with a fruit garnish but I would have preferred the proportions in reverse, a bowl of berries with just a spoonful of the mousse to top it. I used slightly smaller dessert dishes so it served 6 instead of 4. I replaced the honey with maple syrup and used far less of it so this ended up being only a little sweet with the tang of the yogurt coming through. We quite enjoyed this light and airy dessert. This dessert is super simple, just requiring some advance prep. I used 2% Greek yogurt, because that's what I had on hand, but I love that nonfat is recommended. The mousse was delicious with fresh strawberries. The honey flavor really stands out. It's not as light and airy as a regular mousse - it's creamier like a cross between a mousse and pudding. Rich and velvety frozen chocolate mousse "cake" that was incredibly easy to make (and to eat!). Great company fare that can be made ahead and dressed up as you wish. The mixture didn't fit into a 8-1/2"x4-1/2" loaf pan which foiled my plans for the Cocoa Crumb crust so I served it with Creme Anglaise (page 441), another excellent recipe, and Raspberry Coulis (page 449) from the same book. Creamy and chocolate-y, and the baking instructions worked perfectly. These had a silky, creamy texture and a great balance of coffee to caramel so even those who aren't coffee lovers enjoyed them. I used hazelnut flavoured beans which added a subtle hazelnut flavour (and perhaps resulted in a slightly less concentrated coffee flavour) and served them with the toasted buckwheat chocolate sables from the same book. Lovely silky texture and very nice flavour but it could have used a little vanilla. Really lovely dessert. The richness of the panna cotta was nicely balanced by the fresh mango puree. I used 2 tsp agar agar flakes in place of the gelatin. Creamy, delicious and easy to make, this was perfect for those who prefer milk or semi-sweet chocolate to bittersweet. I used 60% cacao chocolate, and agar agar instead of gelatin. Delicious dessert that at first seemed to be quite a bit of work but each of the components was easy to make and I prepared them a few days before serving. Excellent dinner party dessert. Never having had or made rice pudding before, I was pleasantly surprised by this dessert. It was very creamy with good vanilla flavour and the rice grains retained their integrity. Really delicious with the fruity tasting syrup which I made with half the sugar and the juice of 1 lemon. This was a very nice creamy, subtly flavoured coconut pudding with chewy tapioca adding interesting texture. I used the visual cues provided to determine doneness but kept my eye on the clock as well and was reluctant to pull it off the heat after only 7 minutes even though it appeared cooked. My cooking time may have been reduced because quite a few of the pearls fell apart while soaking. It was a little rubbery after chilling, probably a sign of overcooking. I served it as suggested with the hibiscus syrup (page 450) and fresh strawberries. I'll definitely make this again. Edit to add: I made this again but omitted the pre-soak and boiled the tapioca in water until almost cooked, then proceeded with the recipe, replacing some of the milk with the cooking water. It was perfect. A dessert comprising grapefruit curd, macerated strawberries and the double-butter, double-baked petit beurre cookies from the same book. I probably shouldn't review this recipe as I made rather significant changes to the curd (two-thirds less butter and half the sugar) but I liked my version which allowed the grapefruit flavour to shine. The fruit flavours were bright and were complemented by the rich cookie. These were incredibly involved with brioche, ice cream and salted caramel sauce to make and a finicky assembly, and I didn't think they were worth the effort. Each of the components was excellent on its own but the frozen brioche took on a stale bread quality as it warmed. I would have been quite happy with just a bowl of ice cream and the caramel. I baked the brioche in a regular loaf pan. Good instructions. Was wonderful for french toast. Very little effort (and no candy thermometer - yay!) was required in producing these little candies. I used only cherries, sliced almonds instead of slivered, and made half a batch with white chocolate. A big hit! Maybe I shouldn't have used Trader Joe's organic cornflakes. Added sugar because I thought kids would eat them. They did not. Nor did the adults, actually. Incredibly decadent little bonbons that become silky chocolate cream in the mouth. Having never made truffles before, I was surprised by how easy it was though you do have to work quickly to shape them. These taste exactly like the chocolate you use - so use a favourite - but with a greatly improved texture. An upscale version of a Skor candy bar but much nuttier and made with good chocolate. A candy thermometer is recommended but my instant read digital worked just fine, and lacking large cutting boards, I used baking sheets to flip the candy over. The name says it all though it should include the word "delicious". This certainly lived up to its name with wonderful crunch from the oats as well as the nuts and seeds. I made some substitutions based on ingredient availability and personal preferences (maple syrup for honey, maple sugar for brown sugar, coconut oil for butter, pecans for almonds) which may have led to a shorter baking time of only 45 minutes. I also added the pecans after 30 minutes of baking so they wouldn't burn. I'll definitely repeat this one. Delicious! Texturally, it's the best hot chocolate I've made from scratch: smooth and creamy despite being made with 1% milk and water, with the chocolate and sugar completely dissolved. The flavour can be as sweet and chocolatey as you like it. For my family, I used a semi-sweet (54% cacao) and the smallest amount of sugar. Sweet, shortbread-like crust is one of the easiest I've made, and foolproof too. It can be rolled out or simply pressed into the tart pan. With ground nuts replacing some of the flour, both dough and baked crust become a little more crumbly and harder to work with than the version without. This dough was a breeze to put together in the food processor but I really had to overcome my paranoia about overworking pastry since this is processed to a fairly fine meal with no flakes of butter in sight. I used it for the Apple Pielettes, a recipe that called for quite a bit of handling of the dough, and it still baked up tender and flaky. My go-to galette dough recipe. Perfect and simple. Perfectly thick, delightful pastry cream. Used for a Boston Cream Pie. This recipe has a lot of potential: fruity, lightly spiced, laced with vanilla but it's far too sweet even with the juice of an entire (large and juicy) lemon added. I used 8 dried hibiscus flowers and perhaps I should have crushed them first, but I found that 20 minutes steeping wasn't long enough to bring out their flavour though that may have been sufficient if I'd used tea. I followed the package directions for making a hibiscus beverage and steeped the mixture for 4 hours instead. I served it with Coconut Tapioca (page 382). I'll definitely make this again but with half the sugar. The recipes can seem long, but that's only because they're so thorough. It's also because Greenspan's style has more in common with prose than standard—some might say robotic—recipe language. Greenspan has a knack for recipes with stories and description that make them immediately compelling...the kind of recipes you can turn to anytime, for guests or just because you feel like baking. 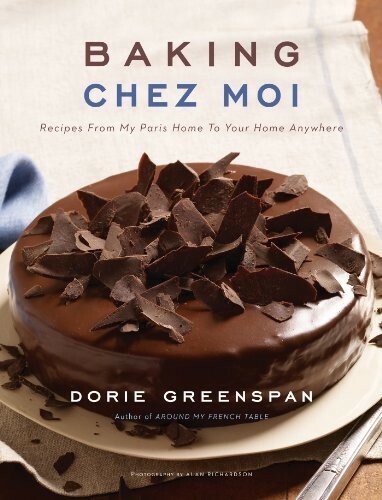 Dorie Greenspan's determined to show you that French pastries aren't all macarons and madeleines...[she] writes in a way that's approachable and inviting, as if she's in the kitchen beside you. Still, the real genius of this recipe is that it's both incredibly easy to prepare and is made completely in advance. In fact, if well wrapped, you can freeze this beauty for a full month. The resulting pastry delivers a pure and satisfying apple experience; it's also delicately textured, generously buttery and slightly boozy. You could skip the Armagnac, but I wouldn't. The topping of this tart has enough crunch, color and flavor to be a headliner, but it's not: The pears, caramelized in butter and sugar and flamed with brandy, more than hold their own. This simple version calls for nothing more than a dusting of confectioners' sugar and a filling of sweetened whipped cream, and you can pull the whole thing together in under an hour. They are very brittle, and the sweet jam is very soft, so when you bite into them, there’s always a little ooze and a lot of crackle. ...unlike biscotti, croquets are not twice-baked, and they're not as well behaved. They're bound to crack some when you cut them, and their imperfection is part of their charm.